To view The full edition of the Alumni Calumet Winter 2018, click on the above picture of the newsletter cover and it will open in a separate window. 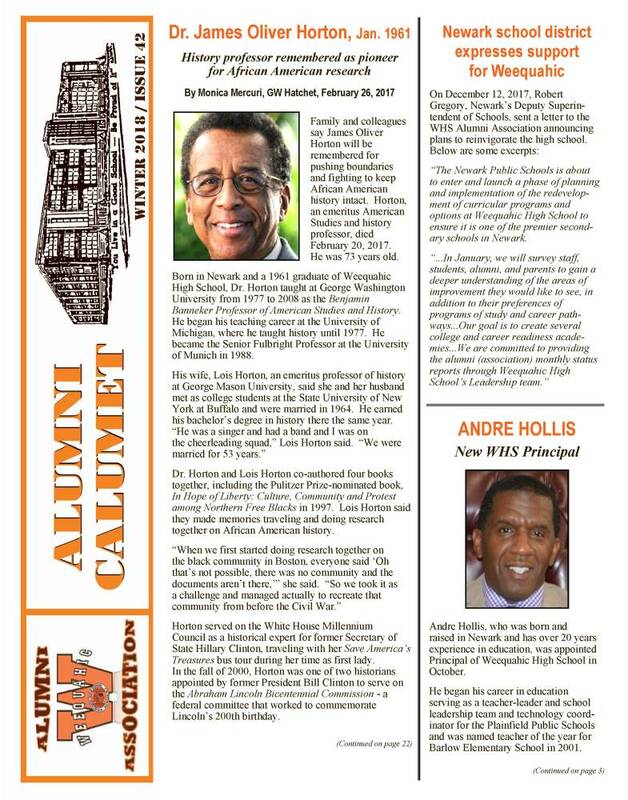 * Andre Hollis, Weequahic’s New Principal. * Local Control Returns to Newark. * The Synagogues of Newark. * The Blooms from La Jolla host salons for starving artists. * 2017 Newark sports hall of fame inductees from Weequahic. * Oldest living Weequahic graduate tells all. * Weequahic grad reopens Newark IHOP. * Alumni firefighter gives back to the homeless. Please Join Us And Become An Alumni Member! Now in our 20th year, the Weequahic High School Alumni Association has become one of the largest, most active, and successful high school organizations in Newark and New Jersey. With local control of the school system returning to Newark, the future for Weequahic High School looks bright and promising. The same cannot be said about our financial resources. As you know, it takes funds to run an organization well. Although our scholarship donations continue to arrive on a regular basis, the money needed for operating costs has decreased over the past few years. So as a gift to you, we are sending the 24-page, Winter 2018 Alumni Calumet as an email link. We hope you will be inspired to become a member or to renew your membership. As part of your membership, you will receive the Alumni Calumet when it’s published throughout the year. Your support enables us to continue to provide funds for scholarships, academics, athletics, and cultural activities.